Sequential 3 retains the distinctive Sinevibes 'look'. 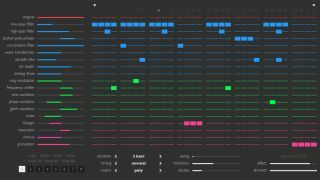 Effects-sequencing plugin Sequential has already won plenty of plaudits, but developer Sinevibes clearly thinks that there's more potential to be unlocked from it. Version 3 has just been announced, and heralds the arrival of a new interface and the option to trigger multiple effects at once. New interface with a 25% more compact layout, animations, rendered on the graphics adaptor. New audio engine with hardware-accelerated math and up to 2x less processor strain. Sequential is now polyphonic, can trigger multiple effects at once. 8 instance snapshots for realtime switching or host automation. Totally new effects: flanger, resonator, three-voice chorus, granulator, analog drive. Steeper -24 dB/octave high-pass filter. Reworked circuit-bent filter algorithm with a resonant pre-filter stage. Reworked barber-pole phaser effect with feedback and bipolar frequency control. Reworked sine, phase, glitch oscillators with bipolar modulation depth controls. New user manual with detailed effects descriptions. Sequential 3 is available as a Mac Audio Units plugin and costs $49. Updates for existing users are free. To find out more, download a demo or buy the plugin, head to the Sinevibes website.